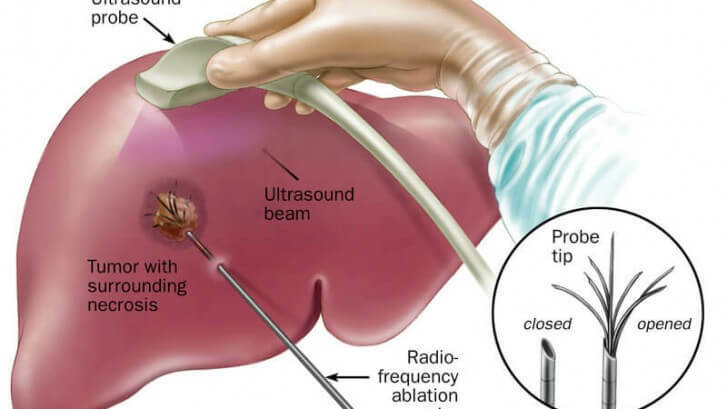 Radiofrequency ablation (RFA) is the commonly used treatment for liver tumour. This treatment generally uses imaging guidance to place a needle electrode through your skin into the liver tumour. Radiofrequency ablation (RFA) is the commonly used treatment for a liver tumour. This treatment generally uses imaging guidance to place a needle electrode through your skin into a liver tumour. Through the electrodes, high-frequency electric currents are passed which creates heat and kill the cancer cells in your liver. Radiofrequency ablation (RFA) is an effective treatment that is used in cases when surgery is difficult to treat liver tumour. RFA is also used for tumours which are very small in size or less than one and half inch in diameter. The success rate to treat liver tumour through RFA is around 85 %. In radiofrequency ablation, imaging techniques like ultrasound, computed tomography and magnetic resonance imaging are used to guide a needle electrode into a cancerous tumour present in your liver. The heat created by the electrodes helps in destroying the cancer cells present around the electrode. The heat created by these electrodes also closes small blood vessels and reduces the risk of severe bleeding. The dead cancerous cells are replaced by the scar tissues that shrink over time. Experienced and trained interventional radiologists are usually consulted for radiofrequency ablation treatment for liver tumour. Anaesthesia is generally given intravenously before the treatment. The place where the electrodes need to be inserted is sterilized and covered with a surgical drape. A small incision is made in your skin to pass the RFA electrode into your liver. A needle electrode is inserted into the site of tumour cells with the help of imaging techniques. Once the needle electrode reaches its place, radiofrequency energy is released. The heat released through the electrodes results in the death of the cancerous cells. Once the procedure is done, the needle electrode is removed and pressure is applied to stop bleeding. The opening of the skin is covered with a dressing. In most of the cases, sutures are not required. Radiofrequency ablation takes around 10-30minutes to complete depending on the size of a tumour. The complete procedure usually takes around 1-3 hours to complete. Pain following radiofrequency ablation is generally controlled by pain medications that are administered through intravenous route. Mild discomfort after the treatment can also be treated with oral medications. Around 5-10% of the patients experience pain a week after radiofrequency ablation. Radiofrequency ablation is an effective, minimally invasive treatment for liver cancer. When surgery cannot be done to treat liver cancer, RFA is the usually used. More than half of the liver tumours that are treated with radiofrequency ablation have not recurred. The success rate for completely removing small liver tumours is more than 85 %. The procedure does not take long time and rapid recovery is generally reported. It is a less expensive treatment for a liver tumour. No surgical incisions are made during RFA, only a small nick in the skin is made which does not require stitches. If you are suffering from liver tumour symptoms then you can consult the oncologist in Hyderabad. Liver tumour treatment in Hyderabad is very common and can be treated by oncologists. Dr Abhilash Sandhyala is the best interventional oncologist in Hyderabad who can perform radiofrequency ablation for liver tumours.